Located near Umbai and 10 km south of Bandar Melaka, Pular Besar or ‘ Big Island' is a mysterious island that has many fables and legends behind its origin. Some say that the island resembles the shape of a pregnant woman, due to a story that a princess who, heart-broken because of her husband's death, jumped into the seas and consequently, her body floated and took the form of an island. As she was pregnant at that time, Pulau Besar, with a landscape resembling a belly, was born. On the island, one can find a cave which is believed to be used by ancient warriors for practising magical arts. Yet another sight is a giant rock called ‘Batu Belah' or Split Rock. Legend has it that a magician trapped his apprentice inside the rock by splitting it in half and then rejoining it with the apprentice inside. Today, most people would enjoy the recreational activities on the island. There are resorts, a yacht club and a host of water-sport facilities. Visitors can also enjoy evening strolls on the sand, swimming in the calm waters or snorkelling the seabed. 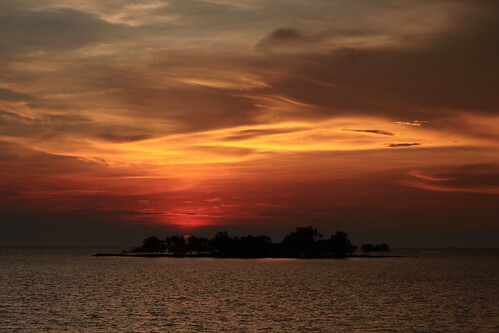 The tiny island of Upeh is located near Klebang town in Malacca. During the War, it was used as a scouting point for invading ships in the Straits of Malacca. Also the island was often a nesting ground for pirates. Of course, the pirates have now long been cleaned out, and today, Pulau Upeh is a peaceful getaway for locals and tourists. There is a resort and water-sport facilities are available. Visitors can also visit an ancient well and view relics from World War Two scattered around the island. Perhaps most attractive about Pulau Upeh is that it doubles up as a sanctuary for nesting Hawksbills, one of the rarest species of sea turtles. During the egg-laying season between March and June, visitors can come here to catch a glimpse of Hawksbills coming on the beach to nest. Located near with Pulau Besar, visitor can walk to this island if the sea is low tide. There are some scary stories among fishermen about the island. Pulau Lalang is a beautiful island. It is located to the East of Besar Island. This Island also uninhabited because there are no freshwater source could be found. The beaches of Pulau Lalang is surrounded by white sand and coconut trees. This island was named after a type of popular Malays deliciacy called ‘Dodol’. This island also uninhabited and become a stopover spot for local fishermen for rest and be the shelter for emergency during monsoon and storm. The island is said to be shaped like a jack. So the island was named after the fruit. Like Dodol Island, the island is not inhabited by anyone. It is used as a transit point or stopover place by the local fishermen. The island has its own story. It lies far out to sea and no occupants. Undan or Pelican is the name of a sea bird. Long time ago it is widely available on the island and its surrounding. This is an island of coral and abundant fish and snails, many kinds of birds, especially pelicans concentrated on the island. That is why the island was named after the pelican. There is a lighthouse on the island. The lighthouse was built around 1880s. Lighthouse workers take turns staying at the island. At night, the light emission from the island of pelicans that is clear to ensure the safety of ships through the Straits of Malacca. Pulau Burung or Pulau Peringgi (Portuguese) located at the Serkam or Pulai offshore. It was named after Portuguese because the Portuguese collected a laterite stone from the island to make the Fort of Malacca. 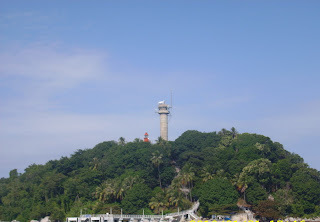 Pulau Menatang is a small island located at the offshore of Teluk Ketapang or Teluk Mas. The island is flooded during high tide. During low tide, local people will come to collect snails and seashells on the island. In the Portuguese language, it was called as "Ilha das Jaos". It lies off the coast of Banda Hilir. Now the process of reclamation of the sea has reached the island. 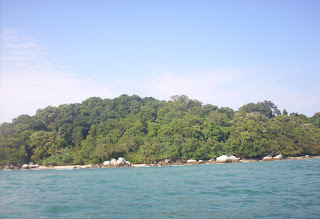 According to old folk’s tales, Pulau Konit used to be the bunian (similar to elves) or spirit settlement. Before the villagers can proceed to Pulau Konit, they have to go through Bukit Teluk Gong; a hilly area where Powertek power plant is located now. The spirits were friendly with the villagers. Whenever there were feasts, the villagers will go to the hill to borrow some kitchenware from the spirits. The “gong” will be sounded to denote their arrival at the hill. Due to the frequency of the “gong” being pounded, the village was later called Kampung Telok Gong. Now, from an undeveloped jungle it has changed to a small village which is rapidly expanding due to the presence of complete infrastructure. Nevertheless, the traditional Malay heritage continues to be well preserved by the villagers. Thus, “Setia Membawa Bangsa” motto, which denotes the loyalty of the Malays in preserving their race, comes into being. Klebang is a famous beach in Malacca. It is situated near Tanjung Kling. There are so many history about the beach since Malacca was opened by Parameswara. The beach was so popular during 40's to 70's as a place for 'Temasya Mandi Safar' or the offerings to god and to cleanse all the sins by bathing in the sea during the month of Safar. Now the practice of Mandi Safar was banned by the State and Federal Government as it is totally wrong in Islamic thought. head out in boats to ‘Kelongs' (Platforms built on stilts on the sea) and fish for squid and other marine creatures. Located in Merlimau area, the beach is so popular with its seafood and seashells that collected by local people. Located in Sungai Rambai area, the beach is very popular among locals as it is the place for mussels and kelongs because the beach is full with mudflats. There are also the place for 'lokan', crabs and 'siput sedut' to breed. The beach is located in Pengkalan Balak, Masjid Tanah. Accompanied by extensive coastal beaches and the unique beauty of fishing villages to make the atmosphere is very peaceful and picturesque surroundings. The beach is popular with many forms of private chalets. It is an opportunity for visitors and tourists to stay and enjoy the lovely atmosphere in the evening. 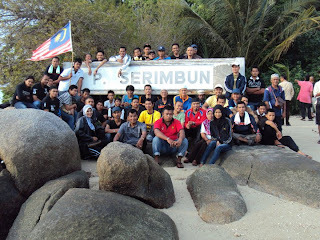 The visitors also have the opportunity to see the joy of returning fishermen from the sea during dusk. Visitors to the Kamunting Golf Coast will have the opportunity to see turtles stain, endangered species. Turtle Hatchery Fisheries Department in Padang Kamunting role in the rescue and protect turtles this stain. Teluk Gong is a village that has become a town, near the town of Klang and Port Klang in Selangor, Malaysia. Among the places near the village Sijangkang, Gulf Commander Rich, Pulau Indah and Kampung Batu Lima. Across the Teluk Gong is Pulau Indah, formerly known as Pulau Lumut. Westport (Westport) has been developed by the Ministry of Transport Malaysia. Teluk Gong is a village of fishermen. Teluk Gong located near to the mouth of the Klang River and the Straits of Malacca, Kuala Sungai Baru, Masjid Tanah. Thus, a jetty was built in Teluk Gong to facilitate coastal fishing boats stop, dock and down the fish down. Many of them use direntang ordinary nets at sea. Besides working as a fisherman, Teluk Gong people working in the industrial sector. Many factories and warehouses have been built in Teluk Gong. Highway Shah Alam - Port Klang to Westport was built and Teluk Gong receive Mercy. A bridge was built by the highway near the Teluk Gong. Telok Gong beaches along the coast, attracting many visitors to picnic, especially on weekends and school holidays. Telok Gong beaches of pure white and ideal for picnics were the main factors contributing to the development of the tourism industry here. 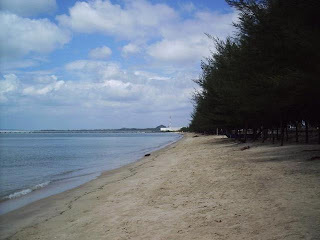 The beach of Tanjung Kling is one of the more recent developments of the Malacca tourism industry. Located 15 km away from Malacca Town, Tanjung Kling is a pleasant stretch of white beach lined with coconut palms and sea shells, perfect for a quick jaunt. 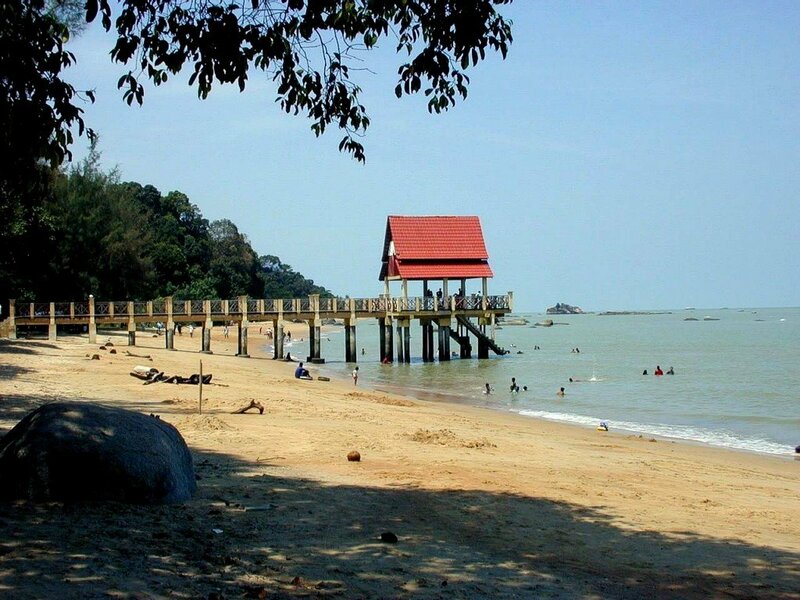 Located approximately 20 km from Malacca Town, the beach of Tanjung Bidara has lush vegetation and a tranquil atmosphere. The beach is more for relaxation or recreational activities that exclude swimming, as the waters are a little murky. Many hawkers line the beach peddling food and there are amenities such as parking lots, playgrounds and showers.